You may wish to read Part 1 and Part 2 first where I talk about the idea for the plugin and early proofs of concept. So the first thing to decide on creating a plugin (after, of course, deciding to make one at all!) is whether to do it yourself or hire someone to do it. Not having the skills or time (or really desire) to learn to do it myself I set about hiring someone to do it. Finding a developer should have been relatively easy, but it’s actually very difficult. PHP programming skills are in high demand which means the best are either very busy or very expensive, or both. I don’t want to go cheap so I found a medium level US company to develop the first version of the plugin. To be honest, this relationship didn’t go well. I won’t name the company as they’re still big in the WordPress world and it was really both our fault and a fault of timing. Neither of us understood the time and complexity that would evolve and the proposed 6 weeks turned into about 7 months. The plugin worked, and produced a simple report as shown below. However it quickly became apparent that gathering the data on-demand like it did was taking too much time and causing problems with loading time and lots of zeroes – as you can see below. So at this point I was speaking to Andrew Rondeau of We Build Your Blog about the plugin and the issues. He had some great suggestions, as well as providing validation of the idea and what I was trying to achieve. So it became our plugin rather than my plugin. We did a lot of research and hired another company to do the next stage of development. We needed to make the plugin more robust and not time out and cause problems. So the company we hired built a website that gathers the data for you. So when you run the plugin the data is pulled down from our server which already holds the data, rather than querying 50+ different statistics. They also built the login system and everything that you still see on the site at this moment. After a few months this version was complete. However (how many times have I said that in this series of articles?!) it became clear they didn’t really understand WordPress that well (the website is not built on WordPress, something we will be moving to eventually) and we wanted to deal with a company with more expertise in WordPress. Another issue was that the plugin still required some user names and passwords, however we wanted (and have achieved) to remove the need for any user names and passwords to be stored on our server for security reasons. So the company we have hired (and still used) cleared up a LOT of outstanding issues with the plugin, the website, and the (almost ready) affiliate system. A few weeks ago the plugin was released into the WordPress.org repository and there is a completely free version available. In part 4 I’ll answer some of the commonly asked questions about Pro Blog Stats. In the meantime, why not download it and give it a try, it’s free! In Part 1 I quickly talked about the problem I have had in the past with gathering data and the thought there must be a solution to the problem of too many data sources. When I started working with paying clients for BTG back in early 2008 it became apparent a better way of getting all this data in one place was required. Yes, it’s taken three years to get to this point! Initially I started keeping track of things in Excel. Partly because I was very familiar with Excel and could write macros to produce reports from the data I gathered. However in the only screenshot I could find of it, you can see it looks a bit rough and ready. However it did what it was supposed to do, but it was still taking me too much time to gather the data. At this time it was still an idea for me to produce reports for clients, so a matter of saving them and me time. So I decided to automate getting the data into Excel in a format then I could automatically create the report. 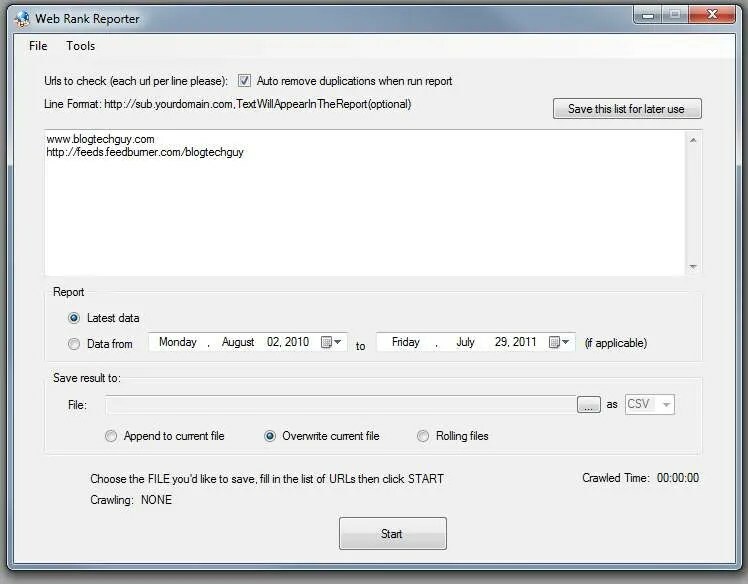 I hired a developer on RentACoder (now Vworker) to develop a piece of desktop software that when given the URLs will go out and gather the stats and save that as a .csv which I could then import into Excel and use to automatically generate my report. The good news is that it worked brilliantly! The screenshot below shows how it looked in it’s basic format. Click for a larger version. It didn’t take much for me to enter the URLs (it saved them) and bring down the data, then a few minutes later I had a report. However there were a few problems, with the main one being that a lot of services required the username and password of many sites in order to get access (just for the record the Pro Blog Stats plugin doesn’t require any usernames or passwords!). This became a pain and was a barrier to getting the information quickly. Then I began thinking about making this a WordPress plugin. The two previous versions were really just proof of concepts. We could get the data directly into WordPress and the user could run reports themselves and pay for the plugin. Well that idea would take a years to come to fruition! I’ll talk more about that in part three. Find Out How Well Your Blog Is Really Doing! Many of you know, Andrew and I have been collaborating on a plugin called Pro Blog Stats. Here is our first ever WordPress plugin! It’s been tweaked and tested by many beta testers and some of them are hooked. Pro Blog Stats gives you over 50 different statistics about your blog or WordPress website – all on one page, within your WordPress dashboard. With Pro Blog Stats, you no longer have to log in to all your different accounts (like Google Analytics, Twitter, Facebook) to see your statistics. And, yes, there is a free version of the plugin. It’s important to note that the plugin will NOT slow your site down. Once configured the only time the plugin does anything is when you request a report. The rest of the time the stats are gathered by our server, not yours. So unlike some other stats plugins, it will not slow down your site. Many of you will know how vital it is to monitor your statistics, to keep abreast of how many visitors you have, the bounce rate, number of subscribers, number of backlinks, time spent on your site and so on. By monitoring these statistics you can determine what impact your on-line decisions and work are having. Do you get more visitors if you blog every day, or four times a week? Did your subscription rate change as a result of your latest blog post? Monitor your statistics… check the impact and repeat them if positive (or stop if negative). Of course, you do need a history of your blog stats to see the trends, and the quicker you start using Pro Blog Stats the better. From the day you install and use the plugin, it will keep a history of your stats. A couple of days later you can compare and see what stats have improved. Then compare again a couple of weeks, or months later! So there we have it… our WordPress plugin… now available for download. The personal e-mails from our beta testers has been extremely positive. This plugin will make a big difference to the success of your blog. We’d really welcome your feedback to see how the plugin can be improved, so get in touch and tell us what you think. Posted on July 28, 2011 July 27, 2011 Categories PluginsTags Blogging, pro blog stats, statistics3 Comments on Find Out How Well Your Blog Is Really Doing!